Are the life and teachings of Jesus a proper focus for the development of a Christian ethic, and could such an ethic fit into the framework of the rest of the New Testament? In The Politics of Jesus, John Howard Yoder answers with a circumspective but enthusiastic ‘Yes!’ Yoder sets out to show why Jesus was of direct significance for social ethics, and why we should consider Jesus normative (POJ, 11). Specifically, Yoder argues for a “messianic ethic” of non-violence from the New Testament – first, by interpreting Jesus’ ministry in the context of the “Jubilee Year principle” that pervaded Jesus’ teachings and self-understanding, and second, by addressing the challenges that orthodox theology surrounding Pauline writings poses to such a stance. Lastly, Yoder rounds out his apology with a discussion of John’s apocalyptic visions, and how they too might be understood within the non-violent ethic. 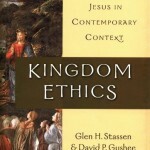 In discussing the relevance of Jesus to ethics, Yoder first addresses the causes of the existing gap between modern ethics and life and ideas of Jesus, explaining that the gap has been created by three main mistakes, the arguments that Jesus is irrelevant, that the bridge from theology to ethics is thin and not much can be brought across, and that ethics can and should be built on common principles, not revealed ones. In addition, Yoder addresses the objections to the use of Pauline doctrine to ethics, citing the usual arguments against Paul, including his teachings on slavery, female submission, and his emphasis on grace over works. Other possible sources for ethical norms and their respective weaknesses are reviewed, individually refuted and dismissed by Yoder. Reviewing Jesus’ historical context, Yoder outlines the influential Jewish political movements of the day, chief of which were the Zealots, who looked to overthrow Roman rule by rebellion and uprising. Yoder exegetes scripture to show how the temptation towards such political action was one of Jesus’ main struggles throughout his public ministry. Yoder then moves into the meat of his argument, which is to demonstrate that Jesus’ instructions and actions specifically repudiated such rebellion, but rather than eschewing political action and retreating into quietism, supported radical non-violent action to confront the principalities and powers, both Jewish and Roman. Jesus’ deeds, Yoder argues, took the form of preaching the Kingdom of God, understood in terms of the Jubilee year principles. The author deduces this from Jesus’s teachings, especially his declarations of self-understanding at the announcement of his ministry (Luke 4), and in his response to John’s disciples (Luke 7). In the former announcement, Jesus’ refers to “the acceptable year of the LORD”, which Yoder interprets as the Jubilee year. In the latter, Jesus repeats his aims of healing, and ministering to the poor, which are again to the forgiveness and restoration of the traditional Jewish practice of Jubilee. 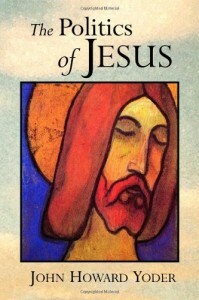 Yoder then translates Jesus’ self-understanding and his other teachings into a Christian ethic which compels Christians to persuade society to change through the practices of forgiveness, non-discriminate love, service, subordination, non-complaining suffering, and even death if loving others puts us in harm’s way. Along the way, Yoder addresses the problematic passages that are typically explained in support of retributive justice, and re-interprets them in light of what he argues is a more logical hermeneutic. These difficult passages include the warring of Israel in the Old Testament, Jesus’ driving out the moneychangers from the temple and his instructions to the disciples to take along swords, as well as the Pauline passages typically used to support capital punishment and just war. Within Paul’s framework of submission to government and justice in Romans 13, Yoder attempts to demonstrate that Paul’s teaching on radical submission to government is nearly absolute, in large part because there is no perfect government, that submission is not based on the existence of such a government, and we are given little Biblical instruction on the limits of imperfect government anyway. On the individual level, Yoder additionally argues that Christians may participate in justice as enforced by police, but this cannot be extended to support the idea of just war – these two types of forceful action, he contends, are different in character and substance, and participation in the military, therefore, is verboten. Yoder wraps up his argument by examining the impact of our modern, highly individualized view of the gospel, and how a more corporate view, that of joining Jew and Gentile, or reconciling people groups to one another, may be a more appropriate approach to understanding the gospel, and in so doing, creating a meaningful, non-violent, global Christian ethic. A social style characterized by the creation of a new community and the rejection of violence of any kind is the them of New Testament proclamation from beginning to end, from right to left. The cross of Christ is the model of Christian social efficacy, the power of God for those who believe (POJ, 242). Yoder’s explanation and re-interpretation of some of the problematic passages of scripture are both interesting and compelling, especially Jesus’ instruction to the disciples to take only two swords with them. Like Stassen and Gushee (Kingdom Ethics), Yoder argues for delivering justice rather than punitive justice as the primary understanding of Biblical injunctions to act justly, and in addition, invokes the Jubilee Year framework for Jesus’ life and teachings. I found his reasoning forceful until he reached his explication of Romans 13, at which point it seemed to me that his exegesis and arguments became a series of unjustifiably complex examinations and re-interpretations of the Greek verb tenses, and strained logic in which he attempted to extrapolate a perfectly defensible individual or ecclesial ethic of nonviolence to a civil ethic. Especially unconvincing was his contention that “the doctrine of the just war is an effort to extend into the realm of war the logic of police authority – but not a very successful one.” His attempt at defining a clear delineation between the nature of the limits of control of police versus the armed forces is, in my opinion, exactly a “matter of degree” (POJ,204), and not a clear chasm, and his overtures to the comparably adequate controls on policing seem naive at best. He would have done better to argue that Christians ought not to be involved in police or armies, rather than trying to justify a clear distinction between them. He continues on to argue that Christians should not be involved in the punitive arms of civil justice at all (POJ, 198) which, while a logical extension of his ethic, doesn’t seem justified by the scriptures, and a clear position to the contrary can be made which works in amenable concert with the non-violence position, so I found this overreach unnecessary. Another claim I found egregiously weak was his globalizing of the radical subordination teaching of Paul, rather than taking it balance with the rest of the New Testament passages discussing the interaction of the individual and government. 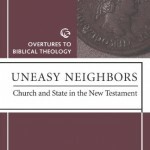 One good example of this is Walter Pilgrim’s Uneasy Neighbors: Church and State in the New Testament, in which he argues for three distinct views, applicable to different levels of governmental moral quality (for a brief overview, see my short review). How then can it be shown that Paul’s demand for submission is not absolute? Granted that the authority of rulers is derived from God, what happens if they abuse it, if they reverse their God-given duty, commending those who do evil and punishing those who do good? Does the requirement to submit still stand in such a morally perverse situation? No. The principle is clear. We are to submit right up to the point where obedience to the state would entail disobedience to God. (p. 392, emphasis added). However, in Yoder’s defense, at this late point in the book, he may have been as tired of his arguments and belabored sentence structures as I was, and perhaps that forced him into the merciful brevity of his reasoning in the final chapters. His stumbling conclusion to a book filled with marvelous, if not revelatory insights into Jesus’ life and teachings, obfuscated by his abuse of parenthetical ideas and sometimes unclear stances (e.g. I am still unclear, after many re-readings, if he is for or against the dichotomies of the Systematic Tradition he describes starting on p. 103), make this volume one of significant but limited value, probably only to the academic who is willing to winnow the truths from it.